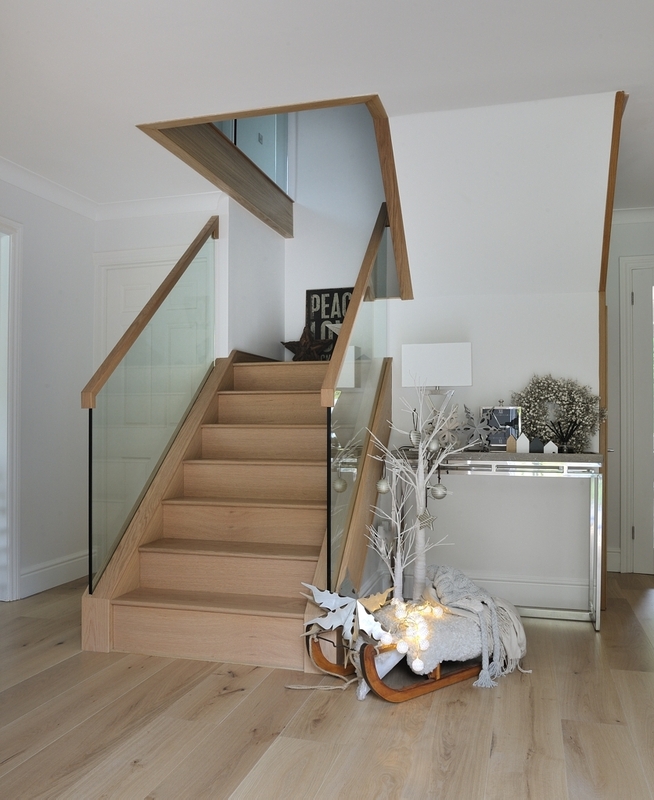 Recently, we’ve been inundated with questions about oak and glass staircases when completing staircase renovations. Probably because the combination of oak and glass creates a modern, stylish and elegant ambience in your hallway. It’s easy for us to see why it continues to be a popular option amongst our customers. When used correctly, glass can work in any home, no matter the particular style of the property. It can suit both traditional and contemporary interiors by creating more natural light and a feeling of added space. As such, we thought we’d look back at some of the oak and glass staircases we’ve created recently. For this project, we used a mix of glass and natural oak with carpeted treads that sweep around the first-floor landing. This allowed us to create a contemporary style staircase with a half landing. 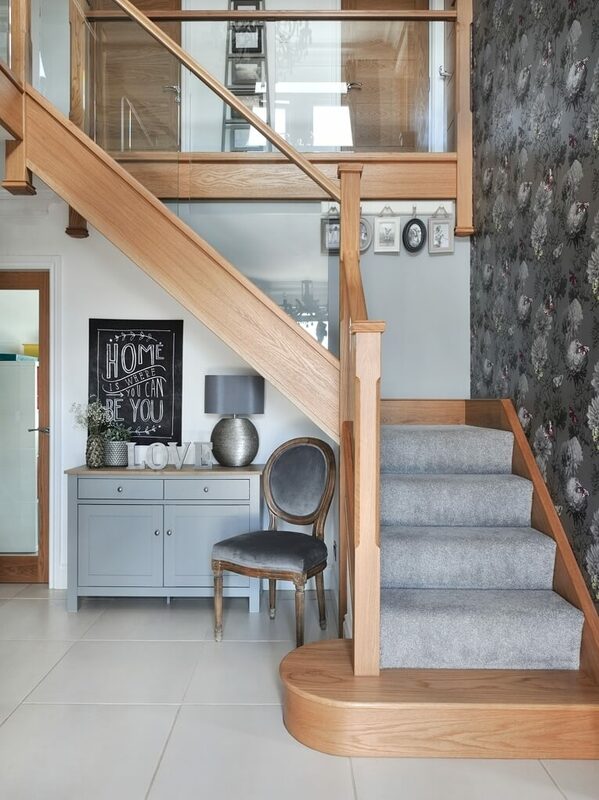 To complete the modern look, we used glass in the staircase frame to create a more streamlined look which acts as an alternative to more traditional spindles. Read more about the Roberts-Green’s customer story. When Mr. & Mrs Cox first got in touch with us, they expressed concerns about how dated the existing staircase in their property was. By incorporating a blend of contemporary oak and glass, we were able to create the illusion of added space with clean, modern lines reflected throughout the design. Read more about Mr. & Mrs Cox’s staircase design. The Lewingtons wanted to update their hallway. They wanted to retain the sense of openness whilst rectifying what had previously been a wasted space under the stairs. We were able to give the staircase a sleek, contemporary look by combining oak treads and handrails with sleek glass panels. The stainless steel bolts set off the entire design to give a modern finish. The final result is practical, beautiful, functional and eye-catching, even if we do say so ourselves! 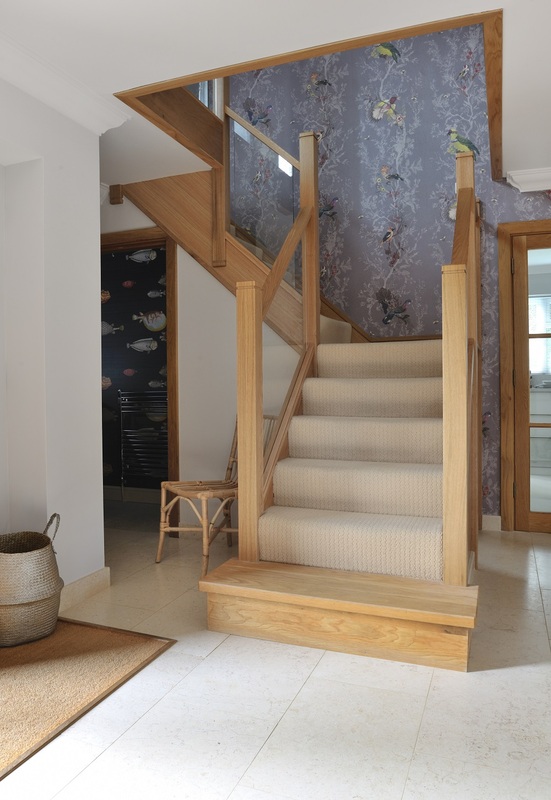 Read more about the Lewington’s staircase design. Utilising a contemporary combination of oak and glass, we designed a centrally-positioned oak and glass staircase with a half-landing turn and gallery landing for Patricia Keane. The inspiration for Patricia’s new hallway had unlikely origins, as it was a simple wallpaper sample that sparked the entire project. With such a unique print, it’s understandable that Patricia wanted to show this off as much as possible. As such, glass seemed like the natural choice. And the rest, as they say, is history. Read more about the Keane’s staircase design. 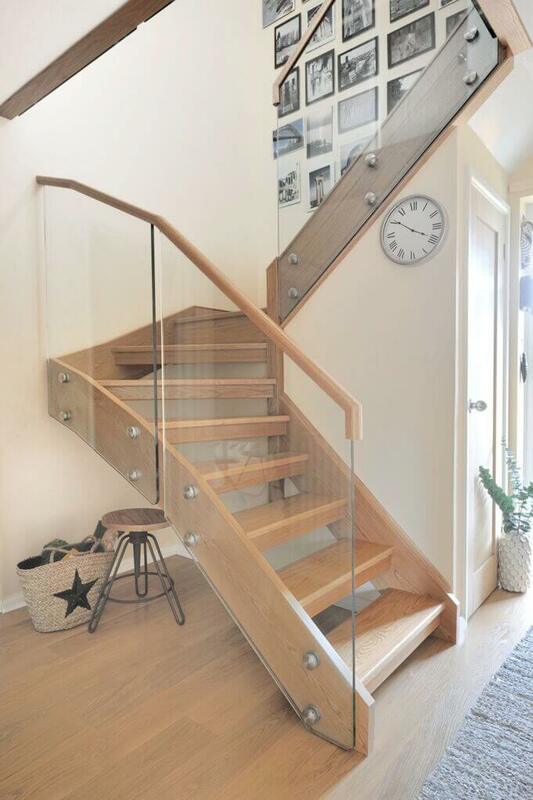 If you want to bring your dream oak and glass staircase to life, get in touch with our team today.